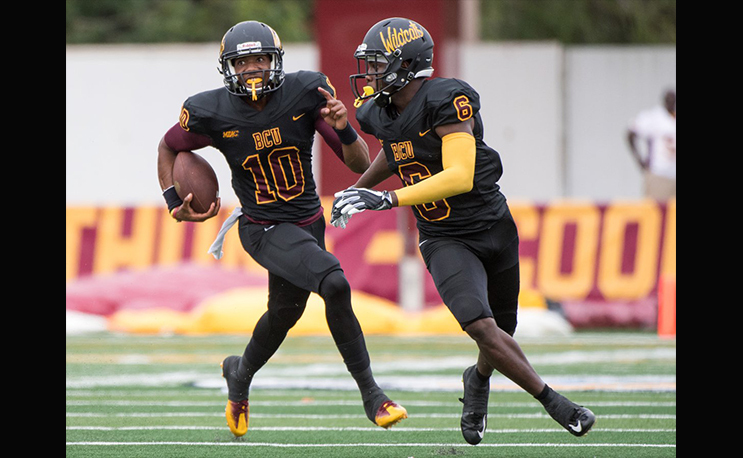 DAYTONA BEACH, Fla. – Jamaruz Thompkins rushed for 126 yards and Akevious Williams 102 to help Bethune-Cookman fend off Savannah State, 24-12 in a Mid-Eastern Athletic Conference (MEAC) game Saturday afternoon before a Municipal Stadium crowd of 6,945. Both Thompkins, a redshirt senior from Tampa, and Williams, a redshirt sophomore from Madison, Florida, accounted for a touchdown for the Wildcats (2-3 overall, 1-1 MEAC) after Savannah State (0-4, 0-2) closed to within five points in the second half. Thompkins’ 69-yard burst with 2:32 remaining in the third quarter gave Bethune-Cookman a 17-5 lead. After Savannah State closed to 17-12 on Rashad Saxton’s 43-yard run with 7:28 remaining, Williams guided the Wildcats on a 10-play, 75-yard drive that produced his six-yard pass to Que’shaun Byrd with 2:21 to play. Williams rushed for 37 yards and passed for 26 on the march. Byrd set up the touchdown with a 29-yard reverse on the previous play. Saxton finished with 103 yards rushing for the Tigers. Playing its first home game after opening the season with four road games, Bethune-Cookman scored on the game’s opening drive when redshirt senior quarterback Larry Brihm, Jr. kept it on a 10-yard run six minutes into the contest. Savannah State’s first points came on a second quarter safety by Tyqueze Johnson. The Wildcats defense, which held the Tigers to 163 total yards on the day, snuffed a golden opportunity when JaMicha Baldwin’s 35-yard punt return put the visitors on the Wildcats’ 13. However, the Tigers managed only a field goal by Giovanni Lugo that made it 10-5 with 4:05 left in the third quarter. Uriel Hernandez accounted for the other BCU points on a 32-yard second quarter field goal. Paced by Thompkins’ and Williams’ rushing, the Wildcats posted 397 total yards for the game. Williams was 8-of-11 passing for 58 yards, with Keavon Mitchell catching four passes for 14 yards. It was a solid win for BCU after dropping its MEAC opener at Howard in Week Four.